Diana Nyad says an existential crisis spurred her to revisit her lifelong dream of swimming from Cuba to Florida, sharing with Larry the grueling training process and the excruciating pain of being stung by jellyfish. Larry King: Why did you do it at age 60? Diana Nyad: You know, I don't know about you, but I never had an issue with age. I never, I don't care. I'd look in the mirror, the lines are coming, the breasts are lowering, I don't care. But when I started to reach 60, and I had been in the broadcast business, had a lot of fun following the best in the world pursue their excellence in the world of sports-- Olympic Games, Wimbledons-- for 30 years, and I started to feel like a spectator. I wasn't a doer anymore. And I think I also started to feel this existential angst that I wasn't the person that I could admire. I wasn't living live to the nth degree. I wanted to touch every fiber of my potential. And I knew that former dream of mine, Cuba to Florida, that I had tried at 28 and not made, it's still the Mt. Everest of the oceans. Still nobody had done it. Many had tried. It was like an untouchable star, and I wanted to chase it. I wanted to be everything I could be. Larry King: Did you ever want to be in the Olympics? Swim in a pool? Larry King: You were a long distance swimmer. Diana Nyad: Yeah. Was swimming over the curvature of the Earth with a steel trap mind. I wasn't that great a sprinter. Larry King: A lot of people told you not, probably, not to do it, right? Diana Nyad: Yeah. Everybody. Everybody I know. Larry King: How'd you train for that? Diana Nyad: You know, it's grueling. I respect all the endurance athletes on Earth. Whether you're climbing Mt. Everest or you're running across the Kalahari Desert in 124 degree heat, you have my respect. But with this, you know, it's a sensory deprivation exercise. Your eyes are covered, your ears are covered. So you go out and swim 14 hours one day. You're not in shape yet. You lie on the bathroom floor in the fetal position that night. You can't make it to bed. You know what needs to be done. No stone unturned. The next day, you swim 15 hours. And after a year, you feel like you can walk through a brick wall, and you're ready. Larry King: How long did it take? Diana Nyad: 52 hours and 54 minutes. Diana Nyad: You do technically stop. You can never touch the boat, or hang on to anything, or sit on a kickboard. But you tread water and you grab nutrition. You've got to eat and drink. Larry King: Who made those rules that you can't touch the boat? Diana Nyad: There's something called marathon swimming. It's a sport, just like marathon running. You know? Larry King: Did someone pay you for this? Diana Nyad: No. The opposite. We paid plenty. And a team of 44 people. It looks very solitary. If you were out in a helicopter following me the whole way, you'd only see one pair of arms coming up. But there's the shark team, and the jellyfish team, and the navigation team, and the medical team. It's a true expedition. And not one of them got paid a time. We did this for the nobility of friendship and the grand adventure of it all. Larry King: Was there a moment you thought of giving it up during the swim? Diana Nyad: Not during the swim. In training, a few times. Cried, had a few tantrums. Larry King: But not during the swim? Diana Nyad: Not during the swim. I think, do you know what it is, Larry? I think that resolve drives you. Larry King: What time of day did you start? Diana Nyad: I started at 9am. And you've got a resolve. When you stand on that Cuban shore, you feel that nothing, nothing unexpected or unexpected-- the box jellyfish? I wouldn't wish that on my worst enemy. That's the most potent venom on planet Earth. Larry King: What did that do to you? Diana Nyad: When you're hit with that, your spinal cord is paralyzed. You're in anaphylactic shock. Larry King: Were you bitten at all? Diana Nyad: I had stings all over. I swam into a swarm of a million of them. I should have died that night. No hyperbole. Larry King: You know, Diana? Larry King: Some might say you're nuts. Diana Nyad: Well, you can say that about anybody who does extreme things. Felix Bumgartner dives in from outer space, you know? Larry King: I know. Evil Knievel. 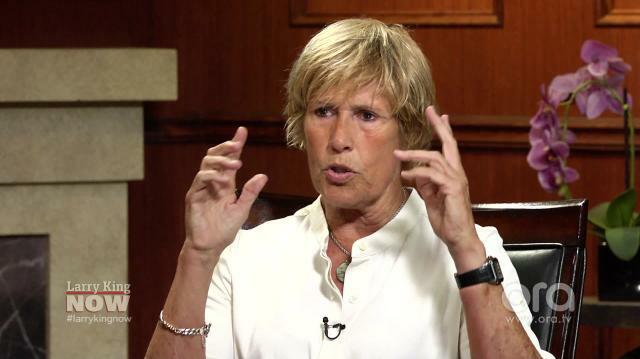 Diana Nyad: He could have died. Maybe it's nuts but what should you? Just sit around on the couch and eat Cheetos all day?